Two of Seattle’s new bike-sharing services are making their bicycles more accessible to folks without a smartphone or credit card. Spin announced today that it is rolling out Spin Access, a program that lets users buy prepaid cards at retail locations and unlock bikes by texting a code to a dedicated phone number. Customers can visit the Bike Works shop in Columbia City to purchase a card; riders with valid ORCA LIFT cards will get a 50 percent discount. LimeBike announced something similar this past Friday with Cash for LimeBike. 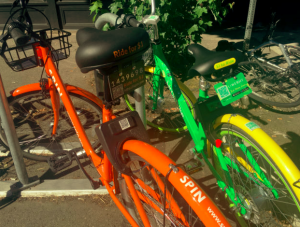 Users can visit LimeBike’s Seattle office at 3625 Interlake Ave. N to load their account with a cash payment; they can then access bicycles across the city. LimeBike is looking to add more locations where folks can add credit to their account. Spin and LimeBike charge $1 per 30 minutes of riding. Both companies have more than 500 bicycles on Seattle’s streets since they launched last month as part of a six-month pilot program.